Background and objectives Dialysis patients have a high risk for inadequate nutrition. Their nutritional status is particularly susceptible to deterioration when faced with intercurrent events such as hospitalization. This study was conducted to improve the understanding of the temporal evolution of nutritional parameters as a foundation for rational and proactive nutritional intervention. Design, setting, participants, & measurements A retrospective cohort study was performed to investigate the temporal evolution of nutritional parameters (serum albumin, serum phosphate, serum creatinine, equilibrated normalized protein catabolic rate, and interdialytic weight gain) and a composite nutritional score derived from these parameters, in two populations: (1) incident hemodialysis (HD) patients who started HD between January 2006 and December 2011 and were followed for up to 54 months (median 16.3), and (2) prevalent patients with HD vintage ≥2.5 years who were hospitalized between January 2006 and December 2011 and followed from 6 months before to 6 months after hospitalization. Results In incident patients (n=126,964), each of the nutritional parameters improved after HD initiation, with a mean composite nutritional score at the 24th percentile at the start of HD and reaching a plateau at the 57th percentile toward the end of the second year on dialysis. Nutritional parameters increased more rapidly and reached higher values among patients who survived longer. In hospitalized patients (n=14,193), the nutritional parameters and the composite score began to decline 1–2 months before hospitalization, reached their lowest level in the month after hospitalization, and then partially recovered in the subsequent 5 months. The degree of recovery of the nutritional score was inversely related to the number of rehospitalizations. Conclusions This study increases the understanding of nutritional resilience and its determinants in HD patients. Application of the nutritional score, pending further validation, may facilitate targeted and timely interventions to avert the negative consequences of inadequate nutrition in chronic HD patients. Inadequate nutrition is frequent in chronic hemodialysis (HD) patients, contributing to malnutrition and protein-energy wasting, which are major contributors to morbidity and mortality in this population (1). Assessing nutritional status in a HD patient is complex and often requires a multidisciplinary team. Clinical practice guidelines recommend that nutritional status be assessed using several tools, including dietary assessment, body mass index, subjective global assessment, anthropometry, protein nitrogen appearance, serum albumin, prealbumin, cholesterol, and technology such as bioimpedance (2,3). We use the term “nutritional competence” to refer to a patient’s nutritional status at the time of evaluation. A patient who is nutritionally competent possesses an adequate nutritional status at that particular time. Therefore, this is a cross-sectional assessment. The term “nutritional resilience” refers to a patient’s capacity to maintain nutritional competence in the face of a challenge (4,5). Thus, nutritional resilience is a dynamic measure that indicates a patient’s response to nutritional challenges, such as hospitalization. Eligibility for intradialytic nutritional supplements in Fresenius Medical Care North America (FMCNA) clinics is currently based on serum albumin levels. However, the use of serum albumin as a nutritional marker is problematic, because inflammation and fluid status can also affect its levels (6,7). The limitations of using albumin as the sole criterion for nutritional intervention call for improved strategies to assess nutritional competence and resilience. Most existing nutritional scores developed in the ESRD population are derived from cross-sectional data and do not consider dynamics of nutritional parameters (8–10). Therefore, a retrospective cohort study was performed in HD patients with the goals of (1) characterizing temporal patterns of nutritional parameters and (2) generating a composite nutritional score from readily available nutritional parameters and assessing its dynamics in incident HD patients over the first 2 years on dialysis and in prevalent patients around hospitalization. The study was approved by the New England Institutional Review Board (NEIRB number 14-109). We retrospectively studied HD patients aged ≥18 years treated in FMCNA clinics between January 1, 2006, and December 31, 2011. Two main analyses were conducted: The first assessed nutritional parameters in incident patients over the first 24, 48, and 54 months on HD, and the second assessed the association of hospitalization with temporal patterns of nutritional parameters in prevalent HD patients. Patients’ monthly averages of serum albumin, creatinine, phosphate, equilibrated normalized protein catabolic rate (enPCR), and interdialytic weight gain (IDWG) were obtained during the analysis periods indicated below. Analyses were performed using all records with complete data for the above five parameters for any given month. A sensitivity analysis was performed in patients with complete data for all months of interest. A composite nutritional score was calculated using serum albumin, creatinine, phosphate, enPCR, and IDWG as follows: For each of these nutritional parameters, the values were standardized by subtracting the mean of all values (for the respective parameter) across all patients and all months of interest from each value and then dividing by the SD of the centered values across all patients and months of interest. For each patient and month, the five standardized values were added and then again standardized as above across all months and patients, resulting in a distribution of composite nutritional scores with a mean of 0 and a SD of 1. These standardized composite score values were then converted to percentiles according to the probability density function of the standard normal distribution. Readers may apply the methodology to their own patients using the data from Table 1, which also gives an example. To graph the rate of change of the composite nutritional score, cubic B-spline basis functions were used to approximate the expectation of percentile of nutritional score. The function of the first derivative was approximated by finite differences. The composite nutritional score was deliberately created based on widely available variables, thus avoiding data acquisition beyond routine practice. Although IDWG is recorded at every dialysis session, FMCNA protocols require at least monthly measurements of the other parameters. Incident patients who started HD between January 1, 2006, and December 31, 2011 were included. Monthly mean serum albumin, creatinine, phosphate, enPCR, and IDWG values were graphed on radar plots at months 1, 3, 6, 9, 15, and 24. The radar plots were scaled such that the innermost point on each spoke represents the minimum average value observed for the respective parameter across all months, and the outermost point on each spoke represents the maximum average value. The composite nutritional score was tracked monthly over 2 years. A subgroup analysis with stratification according to survival time was performed in patients who either survived ≥48 months or died within the first 48 months. We conducted a subgroup analysis in patients without residual urea clearance at HD initiation. We included patients who were hospitalized for 7–14 days between January 1, 2006, and December 31, 2011 (regardless of when their first date of dialysis was) and who had been on HD for at least 2.5 years at the time of hospitalization. We further required patients to have data from 6 months before hospitalization to 6 months after discharge and no other hospitalizations in the 6 months before this index hospitalization. Only data from the first eligible hospitalization per patient were used. This hospitalization cohort and the incident patient cohort described above are separate cohorts with separate criteria (i.e., there are patients who contribute to one but not the other cohort); however, there is some degree of overlap between them. 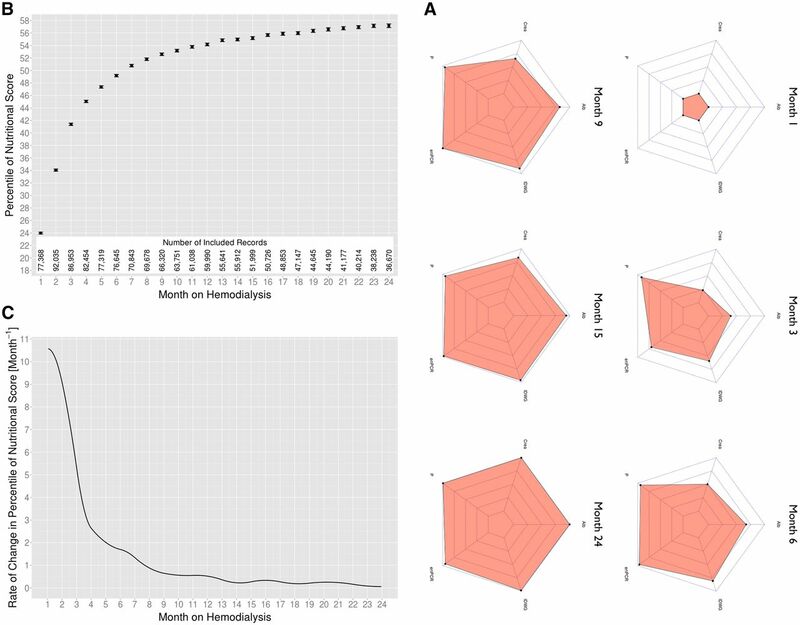 Serum albumin, creatinine, phosphate, enPCR, IDWG, and the composite nutritional score were plotted over 6 months before and after hospitalization. Subgroup analyses were performed with stratification for (1) the number of rehospitalizations over the 6 months after the initial hospitalization, and (2) the three most common categories of reason for hospitalization. 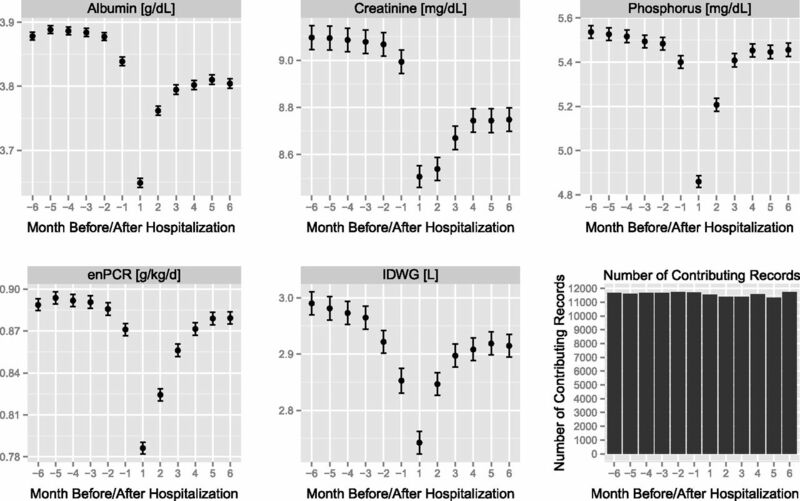 For each month after the first hospitalization, statistical comparison across nutritional score groups was performed by the Kruskal–Wallis test, and we further tested for linear trend. Confidence intervals were obtained via bootstrapping with 1000 resampling iterations. Analyses were carried out using R software (version 3.0.2) (11). Radar graphs were created with the fmsb package (12); all other plots were created with ggplot2 (13). Baseline characteristics of the study populations are shown in Table 2. Averages and SDs of the nutritional parameters and additive score are presented in Table 1. There were 126,964 patients who had complete records for at least 1 month for all nutritional parameters during the first 24 months on HD. All five parameters increased over the first 2 years on HD (Figure 1A). The composite nutritional score improved from the 24th percentile at the start of HD to approximately the 57th percentile at 2 years (Figure 1B). The rate of improvement in the composite nutritional score was rapid after HD initiation and then quickly decelerated over the first 4 months, followed by a slower deceleration over the subsequent several months, with the score gradually approaching a plateau toward the end of year 2 (Figure 1C). Excluding patients who died within the first 6 months on dialysis yielded materially identical results (data not shown). For follow-up over 54 months, see Supplemental Figure 1. A subgroup analysis in patients with no residual urea clearance at HD initiation (59% of the initial cohort) showed materially identical results (Supplemental Figure 2). Evolution of nutritional parameters in incident hemodialysis patients. (A) Radar plots at months 1, 3, 6, 9, 15, and 24 from initiation of hemodialysis. Only patients with a complete set of data for all five shown variables for any given month were included (n=126,964). Each radar plot displays the five variables on axes (“spokes”) arranged radially. The mean value of each variable is plotted along the respective spoke; the innermost ring represents the minimum and the outermost ring represents the maximum value of that variable across all data points. A line connects the data values on each spoke. (B) Evolution of the composite nutritional score in patients starting hemodialysis. The mean percentile of nutritional score over 24 months after initiation of dialysis is shown. Error bars denote 95% confidence intervals. The number of available data records for each month is shown above the x axis along the bottom of the plot. (C) Rate of change in percentile of composite nutritional score in incident hemodialysis patients over the first 2 years on hemodialysis. Alb, serum albumin; Crea, serum creatinine; enPCR, equilibrated normalized protein catabolic rate; IDWG, interdialytic weight gain; P, serum phosphate. The nutritional score trajectories in incident patients stratified by survival time showed that both the initial rate of improvement of the nutritional score as well as its maximum level were directly related to patients’ survival times (Figure 2; for number of included records, see Supplemental Figure 3). Time course of composite nutritional score after initiation of hemodialysis, stratified by patient survival time. The mean percentile of nutritional score is shown, with shaded areas representing the 95% confidence band of the fit. These analyses included 14,193 patients who had complete records for at least 1 month for all nutritional parameters. The nutritional parameters began to decline 1–2 months before hospitalization, reached their nadirs in the month after hospitalization, and then recovered to varying degrees in the 6 months after this initial hospitalization (Figure 3). This pattern is also reflected in the composite nutritional score (Figure 4A). The rate of decline in the nutritional score rapidly accelerated in the 2 months before hospitalization, and the score rebounded over the 3 months after hospitalization, albeit not to the original level (Figure 4B). Time course of individual nutritional parameters around hospitalization. The bottom right plot shows the number of available records for each month. Dots denote the means. Error bars denote 95% confidence intervals. enPCR, equilibrated normalized protein catabolic rate; IDWG, interdialytic weight gain. Evolution of composite nutritional score around time of hospitalization. (A) Mean percentile of composite nutritional score over the 6 months before and after hospitalization. Error bars denote 95% confidence intervals. (B) Rate of change in percentile of composite nutritional score around time of hospitalization. Of all hospitalized patients, 8431 (59.4%) were rehospitalized within 6 months of the initial hospitalization. Analysis broken down by number of rehospitalizations during these 6 months revealed that the degree of recovery of the nutritional score showed a clear, inverse relationship to the number of rehospitalizations, with patients who were not rehospitalized experiencing a full recovery of their nutritional score (Figure 5A). At each of the 6 months after the initial hospitalization, comparison of mean percentiles across the five rehospitalization categories yielded highly significant results (P<0.001 for every month). Likewise, there was a highly significant “dose-response” relationship between number of rehospitalizations and percentile of the nutritional score at each month after the initial hospitalization (all P<0.001). The most common reasons for hospitalization were infections, circulatory system causes (including cardiovascular disease and stroke), and gastrointestinal system causes. Nutritional parameters showed a similar pattern of decline and recovery regardless of cause of hospitalization (Figure 5B). However, of the three groups, the gastrointestinal diseases group consistently had the lowest nutritional score throughout the 12-month period. 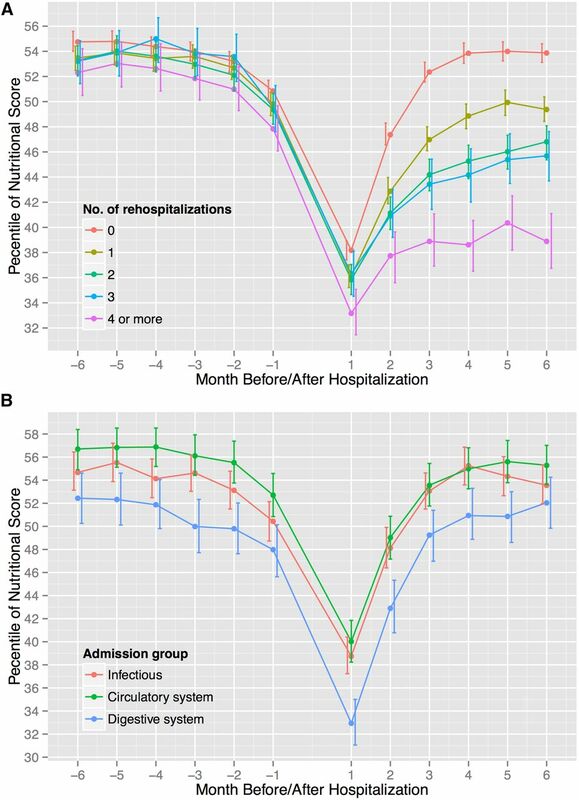 Evolution of composite nutritional score around time of hospitalization, stratified by number of rehospitalizations and by cause of hospital admission. 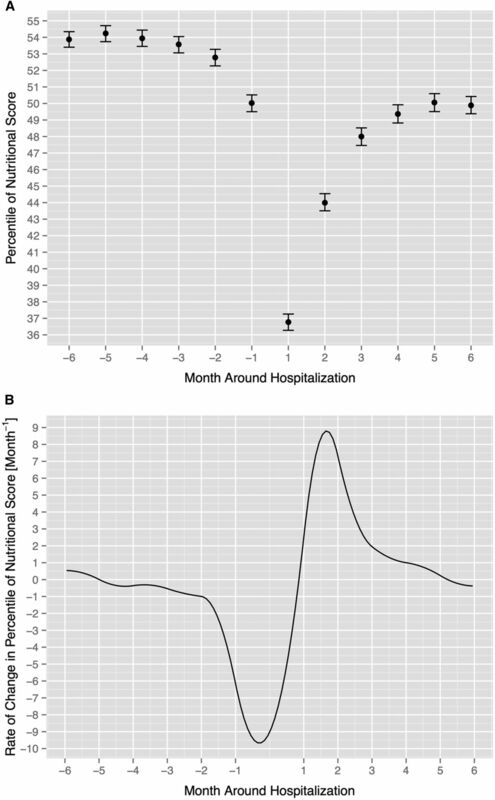 (A) Mean percentile of composite nutritional score over the 6 months before and after initial hospitalization, stratified by number of rehospitalizations. (B) Mean percentile of composite nutritional score over the 6 months before and after hospitalization, stratified by the three most common causes of hospital admission (infectious disorders, cardiovascular/circulatory system disorders, and digestive system disorders). Only patients with no rehospitalizations in the 6 months after the initial hospitalization are included in this analysis. Error bars denote 95% confidence intervals in both plots. This large retrospective study, comprising close to 100,000 incident HD patients and >14,000 hospitalized patients, describes the dynamics of nutritional parameters after HD initiation and around hospitalizations. Although the five parameters examined are considered nutritional indicators, there are also caveats regarding their use as nutritional markers, which emphasizes the need to consider multiple parameters in nutritional assessment. Serum albumin is influenced by inflammation (6,7). IDWG is a surrogate for dietary intake but may also reflect fluid and sodium balance. The enPCR is a marker of steady-state protein intake (3). Whereas low enPCR reflects decreased dietary protein intake, very high enPCR could indicate tissue catabolism. Predialysis serum creatinine, an indicator of muscle mass (14), is also influenced by meat intake, residual renal function, and dialysis adequacy (15,16). The score calculated in this study, reflecting serum albumin, creatinine, phosphate, enPCR, and IDWG, indicates a relatively rapid improvement in these nutritional domains over the first few months on HD, followed by a gradual leveling off and eventually leading into a plateau toward the end of the second year. A subgroup analysis in patients without residual renal function at dialysis initiation showed materially identical results, indicating that the described trajectories are robust findings. Although all five analyzed parameters increased after initiation of HD, their rate of increase differed, with phosphate showing the fastest rise, followed by enPCR, IDWG, albumin, and creatinine. This seems biologically plausible, with phosphate being a rapidly responsive marker reflecting increased dietary intake. This is followed by enPCR, which might be expected to react somewhat slower because it may initially reflect tissue catabolism to some extent, which gradually decreases over time and counteracts the underlying increase in enPCR related to protein intake. It is plausible that albumin would take longer to recover than the other markers mentioned above, and that creatinine, being a reflection of muscle mass, would be the slowest parameter to recover. Improvement in nutritional parameters after initiating dialysis has been observed in previous studies in incident patients (17–19). As shown in Figure 2, the nutritional score showed a decline in the months before death, a finding that has been demonstrated for several parameters in previous studies, including IDWG, serum phosphate, and serum albumin, which are components of our nutritional score (19,20). We found nutritional parameters to decline 1–2 months before hospitalization, reach their nadir right after hospitalization, and then improve again over the subsequent 5 months, although not to their original levels. Nutritional resilience refers to the degree to which a patient’s nutritional status is affected by intercurrent events (in this case, hospitalization). The nadir as well as the subsequent rate and degree of recovery of each individual parameter and the composite score characterize each patient’s nutritional resilience. Some patients are more susceptible to nutritional setbacks and protracted recovery than others (i.e., they possess a lower nutritional resilience). Of note, not all hospitalizations are comparable stressors to nutritional status. Similar to recovery after initiation of HD, recovery after hospitalization was not homogenous among the five parameters. Most notably, serum phosphate almost recovered to prehospitalization levels, whereas serum creatinine recovered poorly. Loss of lean tissue mass from acute inactivity with hospitalization can occur from decreased protein synthesis rate (so-called “anabolic resistance”) and elevated cortisol levels in the setting of inflammation (21–23). The incomplete recovery of creatinine may reflect the delay in regaining muscle mass, but protein intake likely also plays a role. In hospitalized HD patients, the composite nutritional score demonstrated the greatest magnitude of change in the 2 months before and after hospitalization, but even in patients with no rehospitalizations, the posthospitalization recovery was protracted over 4 months. Among patients who were rehospitalized more often, the nadir of the score was lower and recovery was less complete. The most common hospitalization causes demonstrated similar nutritional trajectories. Compared with other causes of hospitalization, the gastrointestinal diseases group had a lower nutritional score throughout the prehospitalization and posthospitalization periods, and this likely reflects increased susceptibility to dysfunctional nutrient intake, absorption, and/or metabolism. It is tempting to speculate that the prolonged nutritional recovery time observed in rehospitalized patients is caused by the repeated detrimental effect of hospitalization on nutritional status. An additional potential explanation may be found in the behavior of complex dynamical systems (24): Such systems often exhibit characteristic properties that may serve as early warning signs for an impending critical transition. Dynamical systems theory describes a property called “critical slowing down,” whereby recovery from perturbations becomes increasingly slow. In this context, the recovery time in our nutritional score after perturbation of the system by hospitalization may also be an indication of how close the patient's biologic system is to a critical transition. As such, a patient's nutritional resilience may be a direct measure of his or her health and impending complications. One might expect that an individual patient’s nutritional score recovery time after hospitalization (even without rehospitalization in the subsequent 6 months) may be indicative of downstream complications or mortality. Our study was not designed to analyze this aspect, but it would be a worthwhile investigation. We deliberately chose the 2.5-year vintage cutoff for our hospitalization analyses because the parameters of interest undergo, on average, marked changes in the 2 years after HD initiation. This approach limits the interference between these trajectories and our hospitalization analyses by allowing patients to stabilize after HD initiation before entering the hospitalization analyses. The effect of hospitalization on nutrition might vary in magnitude among patients of different dialysis vintage; however, our focus was on elucidating the general pattern and time course of the response, rather than characterizing the relationship between vintage and the effect of hospitalization or ensuring that the depicted response was the average of patients of all vintages. In addition, a shifting baseline before hospitalization would interfere with the interpretation of the response. Therefore, we felt that the benefit of reduced noise unrelated to hospitalization was the greater value for this particular analysis. A limitation of this study is its retrospective and observational nature. This design renders the study subject to potential bias owing to nonrandom data missingness. For example, in the incident patient analyses, patients who missed laboratory draws may have had worse nutritional status than those who had data available. We addressed this concern by conducting sensitivity analyses that included only those patients who had complete data throughout the entire time period of interest. These analyses, in contrast with the shown analyses, likely included particularly healthy participants and therefore were subject to bias in the opposite direction. Yet these analyses showed materially identical results, which suggests that the presented time courses of the nutritional score are fairly robust across the HD population. For the analysis of hospitalized HD patients, no data were available during hospitalization; therefore, our analyses were limited to outpatient records before and after hospitalization. Therapy and changes in diet during hospitalization may have affected the parameters analyzed in this study. Another limitation is unavailability of data regarding dietary intake, body composition, socioeconomic status, and depression, preventing more in-depth analyses. In the incident patient analysis, changes in the mean composite nutritional score could have been affected by attrition from mortality. Patients with lower nutritional scores who died early in follow-up, resulting in a higher mean score among survivors, could have contributed to the increase in the nutritional score over time. 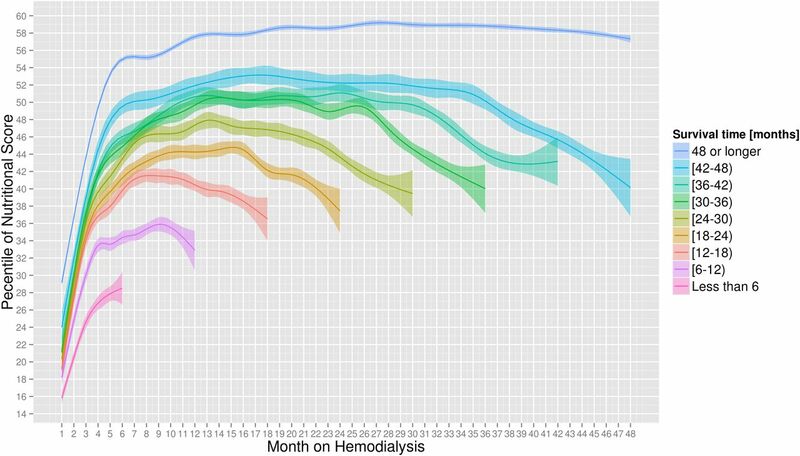 However, sensitivity analysis excluding patients who died within the first 6 months on dialysis showed similar results to the original analysis. The composite nutritional score utilized in this study is amenable to automation and, particularly when expressed as a percentile in relation to a reference population, may have practical utility in nutritional competence assessment. However, before a recommendation can be made for the score to be applied for nutritional interventions, it will be necessary to validate it further. In particular, it would be desirable to show that the score correlates with nutritional status as determined by reference methods (e.g., bioimpedance), and preferably also that it is responsive to dietary interventions. The presented score and similar methods are expected to afford opportunities to better segregate malnutrition from inflammation and be more proactive in addressing nutritional deficiency. The aggregation of several nutritional domains into a single score provides several potential advantages. First, when automated, a composite score is easier to track in clinical practice than multiple individual parameters. Second, similar to how combining medications with a common desired effect but different side effects can concentrate the desired effect while distributing the side effects, combining several parameters that have a common nutritional component but more dispersed other determinants into a composite score can increase the specificity. Third, the various components of the score represent different aspects of nutrition. For instance, a marker such as serum creatinine can be considered more reflective of the body’s nutritional “inventory,” whereas serum phosphate is arguably more reflective of current intake and appetite. As such, a composite score may provide a more comprehensive picture of nutritional status. A better understanding and more systematic and routine assessment of nutritional competence and resilience in chronic HD patients may improve outcomes by facilitating determination of rational, evidence-based criteria for nutritional supplement prescription and other nutritional interventions. Of note, we do not advocate the use of the presented nutritional score in its current form for prediction of mortality (or other outcomes). Some of the parameters used for our score may have U-shaped or other nonmonotonic associations with such outcomes, and simple addition with equal weighting may underestimate the relationship between the individual components and the outcomes of interest. For visualization of trajectories of nutritional status, however, as desired for this article, our chosen method of aggregating the components appears justified, because nutritional status does arguably relate to these individual components in a monotonic fashion. In future studies, combining the dynamics of nutritional parameters with cross-sectional parameters can be applied toward development of risk prediction models to identify patients at high risk of hospitalization and mortality, as well as patients with low nutritional resilience who may benefit the most from timely and more aggressive nutritional intervention. However, the same validation requirements as mentioned above would apply. The effect of oral nutritional supplementation on nutritional patterns and associated clinical outcomes also needs to be assessed in prospective trials. S.T. and P.K. are employees of the Renal Research Institute, which is affiliated with Fresenius Medical Care North America. M.M.Y.W. and Q.X. are former employees of the Renal Research Institute, and M.M.Y.W. is now a research consultant with the Renal Research Institute. L.A.U. and F.W.M. are employees of Fresenius Medical Care North America. P.K. and F.W.M. hold stock in Fresenius Medical Care North America. This work was funded by the Renal Research Institute. Parts of this work were presented at the Annual Meeting of the American Society of Nephrology, held November 5–10, 2013, in Atlanta, Georgia. This article contains supplemental material online at http://cjasn.asnjournals.org/lookup/suppl/doi:10.2215/CJN.08430814/-/DCSupplemental.